With Valentine’s Day putting flower prices at a premium, there’s a good chance that those of us born in February may have never received a single stem for a birthday. For those of you with anniversaries this month, there’s a darn good chance any bloom brought home will be a red rose, since it’s hard not to walk into any florist or grocery store not decked out in Valentine this month. With the lightening speed of life these days, it makes sense to double up on holidays and special occasions, but taking the time to recognize someone’s special day in the midst of the month where everyone is buying flowers and balloons can make it even more special. 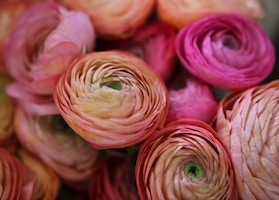 If you want to honor a birthday or anniversary in February, ranunculus are the perfect pick. While the name isn’t very pretty, the flower ranunculus is a stunning spring-bloomer. The round blooms are riffled with tightly woven petals that open up like a rose, but reveal a more symmetrical shape and slightly less structured beauty. Held aloft on graceful, slightly nodding stems, similar to a poppy, the buds of the ranunculus are green, opening up to papery petals that come in buttery yellow, bright pink, true red and whites fading into blush. Several stems of complementary colors alone or mixed with dainty waxflower will remind you that spring is right around the corner. Stems of a single color by themselves in a glass vase are also very striking. Both the symmetry and the spiral arrangement of the petals follow the golden ratio, making this bloom a focal point. For a charming gift, consider trimming the stems rather short and arranging in a small, round vase. In the Victorian language of flowers, ranunculus carry the message “you are rich in attractions and I am dazzled by your charms”- quite a mouthful for such an unassuming flower. A close relative of the buttercup, the ranunculus gets its name from the Latin for “little frog”- a reference to the lobed shape of the frilly leaves. Sometimes sold this time of year as a potted plant, ranunuculus are perennial plants in most North American gardens, so consider purchasing a container-grown one rather than a cut flower for yearly blooms. They love a little bit of shade and plenty of water. Lesser known, but no less in stature than the red rose of Valentine’s Day, the ranunculus is a special flower that will mark any day this month as special.